Pressures were mounting from every corner ever since I stopped updating my blog. Family, cousins, friends, foes, ex-girlfriends and Rakhi Sawant were threatening me everyday to update my blog. The situation got worsened when me and my girl friend were on the verge of breaking up. She gave me an ultimatum saying "No blogging, no kisses". I had no other choice. Some wise dude truly said, "No man knows more about woman than I do, and I know nothing". 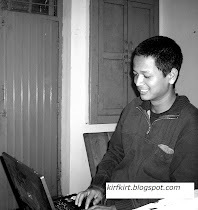 So I wake up in the middle of the night and realized that I haven't written anything for almost 2 years in my blog. "With age comes maturity"-I remembered Kirfkirt Dude saying that. I went back to sleep again. I woke up again. I opened up my laptop and started reading my old post from my blog. I smiled first and then cracked up!! I was once a guy known for his humor in the college and every girl wanted to marry me; but now, with the loss of my hair, I started losing my sense of humor too. No one wants to date me now. This is BAD! So I am in USA and I too have no idea how I landed in this country! So one day my friend Arnab Goswami called me up and asked "The Nation demands an answer". I meekly admitted, "I decided to do my doctorate". Arnav gave me a hypothetical hug via skype and said "Son if you need any answer, just give me a call." I cried, he too did. It was emotional. Like every son, I too forced my mom to search a girl for me, specifically mentioning her to get(send me) two passport size photographs of the girl-one with makeup and the other without makeup. Make choices easier. I even opened premium accounts in every possible matrimonial sites. I didn't want to take any risk. Finally after a month of constant endeavor and hardship, I got a reply in whtevermatrimonialsite.com from an account named "yourworstnightmare". There was this picture of this beautiful innocent lady in her bridal attire. I blushed! Mom I am mailing you the picture of your future daughter-in-law. My mom refuses to talk to me now, so are my sisters. Mom if you are reading this, kindly talk to me (and accept her). Disclaimer: A Phd guy can be phunny sometimes. Scribble something when I am not researching!